Focusing on the GUI would be unwise. Many folks are just now figuring that out. I've been searching for a PowerShell editor to free me from writing my code in notepad. I've tried a number of them on the market, Primal Script by far was the best! Yet, my 45-day trial was over and my boss is dragging his feet with a purchase. So where do I turn? Shell Tools was nice, yet another 45-day trial (they extended it another 45-days) yet eventually leading to a purchase. Don't get me wrong I'm not a tight-wad I'm a Tech (o.k. same thing...). I just wanted a simple editor which I found in the last place I thought I would ever look... A GUI Tool for PowerShell. Don't get me wrong, I love GUI tools but I don't like to introduce them to those who are beginning to learn PowerShell. I prefer that you get your hands dirty under the hood, which PowerGUI allows you to do. 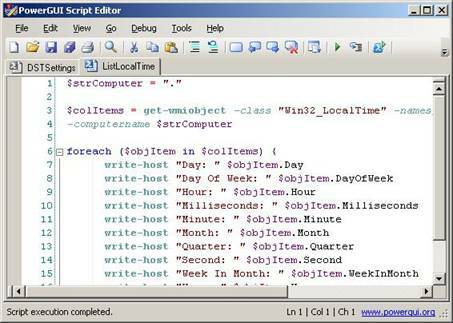 Sure it writes code for you, it also enables you to view the script code written. This is a great way to study code; how it's written and what it's accomplishing. 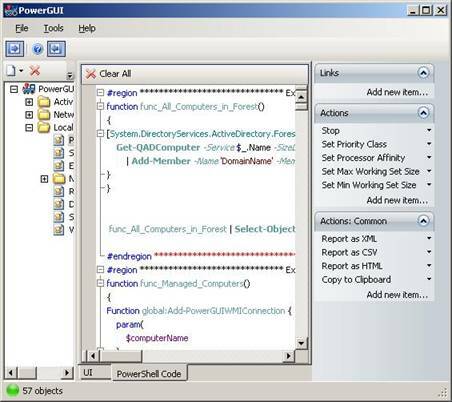 There is actually another good reason to add PowerGUI to your PowerShell Scripting Tool set. The tool is free, no need to register, no 45-day trial period, and a library of functions you can download to extend PowerGUI's capabilities.